We were recently included an article on voluntourism in the August 6th issue of Time Magazine. The article debates the pros and cons of Voluntourism. I hope you enjoy Merilleon’s wonderful account of her trip. It was a great joy to ride with her and the other members of that ride. Over the past 3 years and 7 rides, we have experienced many challenges, the jeep bringing the doctors to our medical camp breaks down, one of our jeeps gets lost or stuck in the dunes, no laundry for more days than we had anticipated! Nothing quite prepared me for the challenges that mother nature offered us this past February. I hope all of you are enjoying your summer! Please click here if you would like to review our ride schedule- We hope you can ride with us this winter! Decision making has never been my strongest point! I have to weigh all the pros and cons, until the FINAL decision is made with great trepidation. 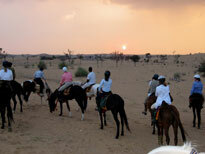 Strangely enough when Caroline, my daughter, casually told me she was going on this Relief Riders International (RRI) trip – a trip which involved many hours of horse riding in the Thar Desert of India – I was fascinated and enormously envious! 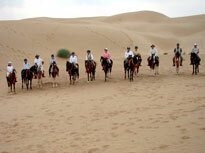 I had grown up galloping the sands of semi desert in South Africa, camping in tents, and working with school children. “That sounds absolutely fantastic!” I said. “I think I will do it with you – if that’s OK?” “Great!” said Caroline. And so I began, without further contemplation, one of the most unforgettable trips of my life. On the 21st February, we met our 14 fellow travelers, took a quick and interesting bus tour of the “new” city of Delhi, with a stop at Gandhi’s tomb, and a ride on a rickshaw through the very narrow streets of the “old” city. There were outstanding displays of fruits, vegetables, beautiful materials, dentists, barber shops and leather shops - you could purchase almost anything you could imagine, and clothes could be sewn in no time flat. Then, the overnight train to Bikaner, our point of arrival in the desert. To me, any overnight train travel is an adventure, but this was doubly so! As the company was mixed – four to a compartment – all thoughts of dainty, flowery nightwear were abandoned. We were given a blanket, sheets and a pillow. The toilets, unfortunately, I felt should be used in an emergency only. For the little foot rests on either side of an open hole in the floor gave an excellent view of the passing ground. Nevertheless just waking up and looking out at the ever changing countryside was really enough to bring joy to my heart! We arrived in Bikaner and were met by Alexander Souri, the Executive Director of RRI, and Dr Vinoy Vighneswar, Chief Medical Officer. We knew then that the trip had really begun. I would not have missed that train experience for anything! We were whisked off in a cavalcade of cars to the Lakshmi Niwas Palace for a delicious breakfast and a stroll around the lovely grounds. After regaining our strength and sense of adventure we were driven through the countryside to Nokha, a town two hours away where a free eye surgery camp was being held. Dr V. K. Gupta, the eye surgeon and his crew, were examining 232 patients of all ages from nearby villages, many quite old and going blind who were sitting peacefully on the floor. 32 of those he treated qualified for cataract surgery. Dr Gupta had an interesting way of indicating the eye to be operated on – a band aid placed above the eye! Apparently sometimes the patient, after having seen the doctor would decide for himself that he really could see out of that eye, and that it was the other eye that needed surgery, so would move the band aid to above the other eye. Dr Gupta very quickly saw what was happening, and to avoid any mistakes, he placed an additional band aid on the correct arm and leg of each patient! We soon met Sunayana. Though a tiny woman in stature, she is warm, friendly, knowledgeable and wise, and was in charge of the total running of our camp lives. She coordinated our meals, all sleeping arrangements, the setting up and striking of our tents, the well-being of the horses and their riders, the transfer of rider to jeep if necessary, and found solutions for all our minor problems. She went about these formidable tasks with quiet efficiency, understanding and competence. She commanded great respect and appreciation from all who worked with her and was fondly called “Madam” by her staff. Riders on the dunes outside of Tantwas. Caroline giving a goat away in Tantwas. As the afternoon cooled off, we gathered in the horse paddock and were each assigned our horse and off we then went with a crowd of children running behind us cheering excitedly. It was at Kakku where we were introduced to the “Bucket Bath” – a bit disconcerting at first but soon an enjoyable part of our lives, always with plenty of hot water, and with plenty of time to enjoy it. The next morning, back at the eye surgery camp, Dr Gupta and his assistants were checking all the cataract patients, giving them specific instructions, medication, and stressing that they had to return for a check up in six weeks. Alexander is hoping to expand this “Give the Gift of Sight” program so that many more people might benefit – eye disease here in India is rife, and many people are going blind, and help is so difficult get. On February the 24th we started out on a long ride to our first tented camp at Tantwas. The weather was perfect, blue-skied, sunny and hot, and the desert exhilarating. At sundown, the most beautiful sunset shone out as we rode towards our destination. It was getting late when we arrived, and there to greet us was the Thakur of Tantwas in all his finery with a 3-musket salute. As he ceremoniously led us into the camp, the skies opened and we were pelted with hail and wind. Grooms grabbed at our snorting horses and we all rushed into the first tent. Eventually the rain stopped and we were entertained by Indian dancers and an entertainer who ate fire and carried hot coals between his teeth! Everything so far had been new and exciting but what was to follow was heartwarming. Our morning assignment was livestock distribution. We drove to a nearby village where we presented 20 goats to 20 of the poorest members of the village. In the afternoon, after our usual delicious lunch served outside by Sunil, (who became known as “Excuse me” as he politely excused himself each time he offered us anything), we drove to a village school to meet two groups of school children. These children, like all the others we dealt with throughout our trip, even though they seemed to have almost no physical possessions at all, were the most beautifully behaved, tidily dressed, happy children that I have ever known. That afternoon we presented 300 students with de-worming pills and educational materials: books, crayons, pencils and pencil boxes. The children lined up in two lines, and under Dr. Vinoy’s supervision, approached the pill giver with wide open mouths. On February 27th, we left Tantwas on horseback for our next camp in Bundvale. By this time we had all become comfortable with our horses – with the possible exception of Candy and Coil, a very determined, stubborn mare who insisted on traveling along at her own good slow pace. Any horse and rider who entered Coil’s space was greeted with rolling eyes, and laid back ears. Soon Sunayana was called in to help and Candy was delighted with a change of horses and was quickly another proud and happy rider. The following morning we visited another school and treated 280 more children. Unfortunately, while we there, a sandstorm developed. By the time we returned to our camp, we could see nothing! For the next 8 hours we remained in our tents! Finally, the sandstorm receded, but ominous black clouds were swirling around and a couple of hours later the heavens opened. We were deluged. Everything and everyone got soaked. The next morning, though. we cheerfully hung out all our wet bedding and clothing to dry. Unfortunately, this was not the end. The sun came out for a while and we went off to our 3rd school to treat another 150 children and then after lunch saddled up for an afternoon ride. We had not been out long before great raindrops started to pound us, While one of the two groups decided to turn back, the group that stayed had an exciting ride, galloping over sand-dunes quite oblivious of the raindrops, arriving back at the camp just as the rain, thunder and lightning descended in full force. That night sitting around the wet dinner table in a leaking tent with the probability of more days of rain, wind and wetness, and the possibility of the horses falling ill the decision was made by the majority to return to Dundlod Fort. Though the weather the next morning showed promise, the decision had been made. As we slithered out of our damp beds into our wet clothes our baggage was collected and the tents struck. This was the 1st of March, The Medical camp at Sukwasi was to be held, and while there was some doubt about attendance because of the weather, as the sun came out so did the people. Men and women of all ages, children and babies came to be seen by one of the many doctors taking part in this free medical camp. There was a dentist, a pediatrician, an internist, a gynecologist, an ear, nose, and throat specialist, and an eye doctor. Free medication was prescribed when necessary and given out by Dr Vinoy. We were able to be very helpful here for there were many tasks: to sign in the patients, to send them in the right direction, to help with the filling, and giving out of prescriptions, and looking out for little children who were waiting in the sun! In all 554 patients were treated. One of the members of our group, an emergency room doctor, said the number of diseases she had seen in just that day were horrifying. There were serious skin diseases, scabies, diabetes, epilepsy, bronchitis, and many other lung diseases, just to mention a few. At the end of the day, as we climbed onto the bus to Dundlod Fort, all I could feel was hope that this clinic had made a difference to the peoples lives . We were greeted at Dundlod with the “Red Carpet” - 2 riders on either side in full regalia at attention on horseback. At the top of the steps, our greeter stood with red paint and rice which he dabbed on our foreheads between our eyes. It was comforting to settle into our rooms with dry beds, though I did miss our tent! The next morning we were given a tour around Dundlod Fort by Kanwar Raghuvenvra Singh Dundlod, the head of the House of Dundlod, or “Bonnie” as he likes to be called. He is very proud of his stable of gorgeous stallions and Marwari mares. The Marwaris are a special breed descended from the original warrior horses of the desert. They are lighter animals, intelligent and agreeable with distinct scimitar shaped ears and they can travel tirelessly for many miles. We were taken out on a ride through the surrounding lands, a total contrast from the desert. Stretches of green carefully irrigated crops and a feeling of lushness pervaded the countryside. After spending two nights at Dundlod we rode to a new camp. It was nice to be back in the wilds again. There was a full moon; the stars were out and the sky was absolutely clear, There was a good feeling of camaraderie for by this stage we all knew each other quite well and we had all been through a lot together. Early the next morning we returned to The Fort to prepare to celebrate Holi. Our last ride culminated in a final gallop by EVERYONE ended with smiles on all our faces! Holi, or The Festival of Colors is a joyful Indian Festival which falls each year on the day of the full moon in the month of Phalgun or March. It celebrates the coming of spring and allows for great wildness and crazy pranks. Everyone gets covered by colored powders, usually when they’re tossed onto you, and there’s dancing and cavorting in the streets. Village notables came to the Fort to pay homage to Bonnie and spend a few minutes chatting. All under the full moon with a panoramic view of the countryside!. We visited three more schools the following day. We treated 200 students at the Indo-International School. This building had been donated by a private donor specifically for students of the Untouchables, the lowest members of the caste system. We continued to the Dundlod Muslim School where we treated another 100 students, and then finally on to a small school outside the fort where we treated 70 more. In all throughout the ride we had treated 1150 children, and it had been always a pleasure being with them. Our trip was now fast coming to an end. We were bussed to Jaipur early the morning of 6th March for shopping! On our morning of departure, Alexander presented us “Journey Blessing” string prayer bracelets to be tied around our wrists – and to be kept there for 41 days. I was sad saying farewell to our group. I look back on that incredible trip with gratefulness. I hope we were able to help a few of the many people we saw. I know I learned so much about the country and the people of India. I learned more about myself too. I will remember everyone on that trip with great fondness as each person was unique but had similar goals, and I know that I have made some new friends for ever.